If you haven’t already considered or been tasked with moving some or all your infrastructure to the cloud, we have news for you: It’s coming. And if you’re like most IT organizations, you’re being asked to do more with little to no budgetary increase each year. Either that, or you’re faced with difficult choices around where to invest—delaying much-needed refreshes or even critical security projects in favor of funding your move to the cloud. You’re not alone in these concerns. But, like other companies have discovered, you may have more cost-cutting options available to you than might initially think. There are practical, cost-effective measures you can take get to hybrid cloud without overstepping your fiscal bounds. 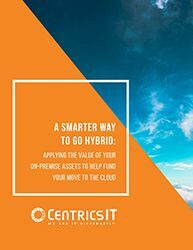 In this e-book, we will dive deep into the practical application of Asset Recovery as it relates to your hybrid cloud initiatives. Our goal is to help you simplify the project, anticipate and mitigate the logistical headaches that you face, free up some of your revenue, and get you to cloud as quickly and efficiently as possible. Every day that passes causes your equipment to lose a small portion of its market value. Download the e-book today to learn how you can turn your decommissioned hardware into usable budget.